Fresh eyes on London: Ice-cream? It may look like a science lab but this is ice-cream being whizzed up in front of your eyes. 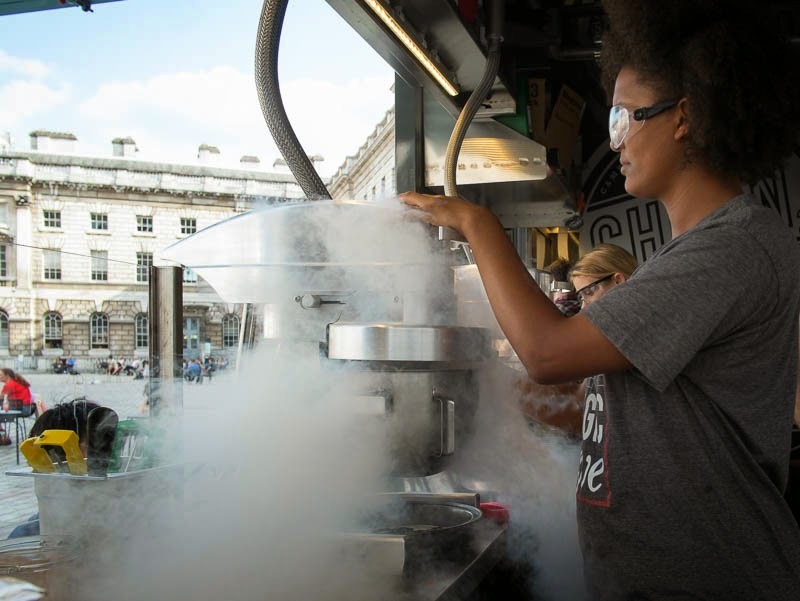 A new pop-up at Somerset house making ice-cream with liquid nitrogen. Just in time for the summer outdoor film season. What a way to settle down and watch ET. That would be fun to watch (the ice cream making and ET). I watch Iron Chef often and I've noticed that the chefs use liquid nitrogen often to quickly freeze things. And, here I am, afraid of a pressure cooker that my mother used to use all the time. Very special way to make ice. That's entirely different. And yes, it does have a bit of a mad scientist feel to it. Is there really a need for this?